Because Walt Whitman kept adding poems throughout his life to his original Leaves of Grass, this "death-bed edition" of 1892 is the most complete version of his finished work. I started listening in the middle because I wanted to hear the Sea Drift poems. The narration of "Out of the Cradle Endlessly Rocking" seemed reasonable . I was skeptical when the narrator began chanting italicized portions . Once my ear was attuned it seemed very fitting, like some ancient incantations . The poetry is beautiful, wonderfully narrated. However, I am required to read certain parts for school and there is no way in the Audible manager or the app to navigate to a specific poem. This is a terrible flaw - anyone should be able to look through the listing of poems and click on which one(s) he or she wants to hear, whether for school or for pleasure. Poor design. Unfortunately, there's no "rating" for this technical aspect of the audiobook. 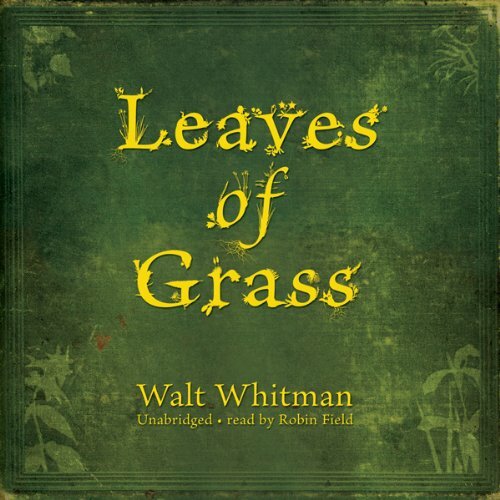 Where does Leaves of Grass rank among all the audiobooks you’ve listened to so far? I said it in my headline, I will say it again. Leaves of Grass is the greatest book of American poetry. Not only did Walt Whitman created free verse poetry, but he created a style of poetry that is quintessentially American. Gone are the rhymes, knights, and gods of a Europe and ancient Greece and Rome. Here are the voices of common American men and women whose lives are worthy of celebrating and memorializing. What other book might you compare Leaves of Grass to and why? Leaves of Grass can be compared to no other of poetry except for Homer's The Iliad and the Odyssey and the Bible. It is a rambling epic that reflects the people and the landscape of America in the latter half of the nineteenth century. It has had a huge impact on American poetry and thought. Up until that time, American poets aped the ancients and the English, as if Americans were incapable of speaking in their own voice. Even today, I encounter American poets who pat themselves on the back for sounding as "authentically" British as possible, as if speaking with an American voice is of no value. Whitman strove to break away from the past and create a poetry of the future. He has succeeded. We have been reading Leaves of Grass for one hundred and sixty years and counting. What does Robin Field bring to the story that you wouldn’t experience if you just read the book? Robin Field brought to Leaves of Grass a passion that I found accessible. I have a paper copy of the book unread on my nightstand for two decades. The audio book allowed me to "carry" this tome with me to the gym, to the car, or to the kitchen. I listened to it wherever and whenever I could, and occasionally I consulted the physical book to reread favorite poems. I tried twenty years to read the physical book and failed. I finished the audio version in one week. I wanted to listen to Leaves of Grass all in one sitting. It is so sweeping and epic. I spent five hours listening to it one day, and I will likely return to listen to it again. Walt Whitman is America's Shakespeare. It should be required reading for every American poet and non-poet and for people beyond our shores. If you write free verse poetry, you must read where it all began: Leaves of Grass. I wish I had read it earlier but the Audible technology did not exist two decades ago. One thing I did while listening to it was to sit at my computer. When the title of a poem was announced, I looked it up on the computer and followed along with Robin Field's performance. I got more out of the book this way. Walt Whitman predicted that he will find and speak to my heart, mind, and body. He has found me, and I thank Audible for this.